Review: Pass the Password, Please. Clearly, I love games. But not all games. I like word games that don’t involve convoluted rules, boards, tokens and the rolling of the dice. I like to get down to the meat of the game. I don’t want to read and follow a bunch of rules, nor waste precious time clomping around colored squares on a board. And that’s why Password was such fun. I loved the little plastic sleeve with the colored window that magically allowed you to see the word. And then there’s the whole romance associated with the television version. You can have your Romeo and Juliet, I’ll take Allen Ludden and Betty White. And, so, for years now, I’ve been searching for a new version of the old Password and always found myself disappointed that it wasn’t available. Disappointed and incredulous. There are so many inferior games that continue to occupy space on store shelves, but the best game of all was no longer available. Betty White was hosting Saturday Night Live, but Password wasn’t in Toys “R” Us. But all that changed this week when I heard that Barnes & Noble was stocking Password. The Golden 50th Anniversary Edition, no less. My heart did a little jig when I heard the news, and at first I didn’t believe it. I asked my source if she was positive that it was really Password. The legit Password. I was assured that it was the bonafied game. It was in my hands within an hour. Here are my thoughts on the new version of the original word association game. Password by Endless Games, $19.95 at Barnes & Noble bookstores or through Barnesandnoble.com. Also available from amazon.com. 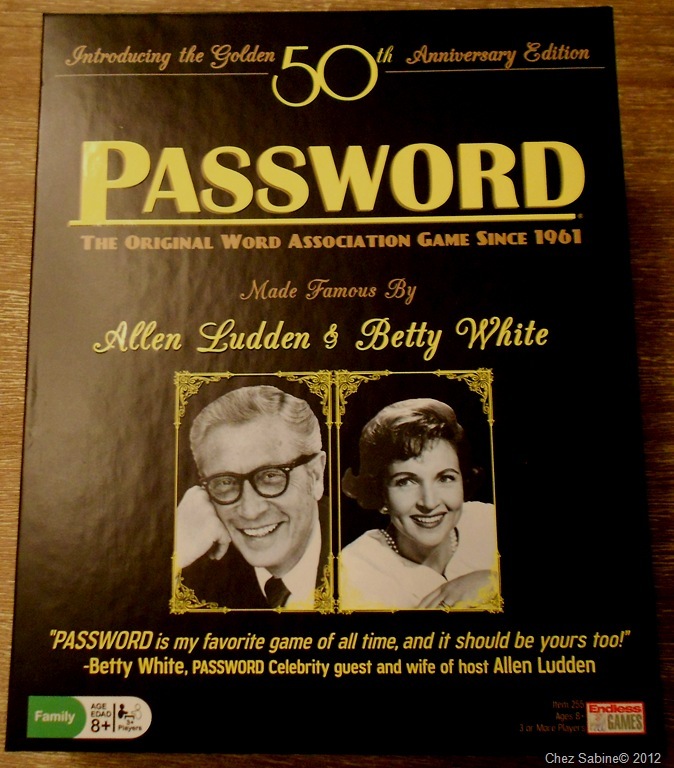 First look: The game comes in a black box with vivid yellow script and black-and-white photos of Allen Ludden and Betty White on the front. The game is suggested for ages 8 and up and for three or more players. Password comes with two card holders used to reveal the words one at a time. The game also includes a fat stack of word cards, a scoring tablet and a scoring indicator. 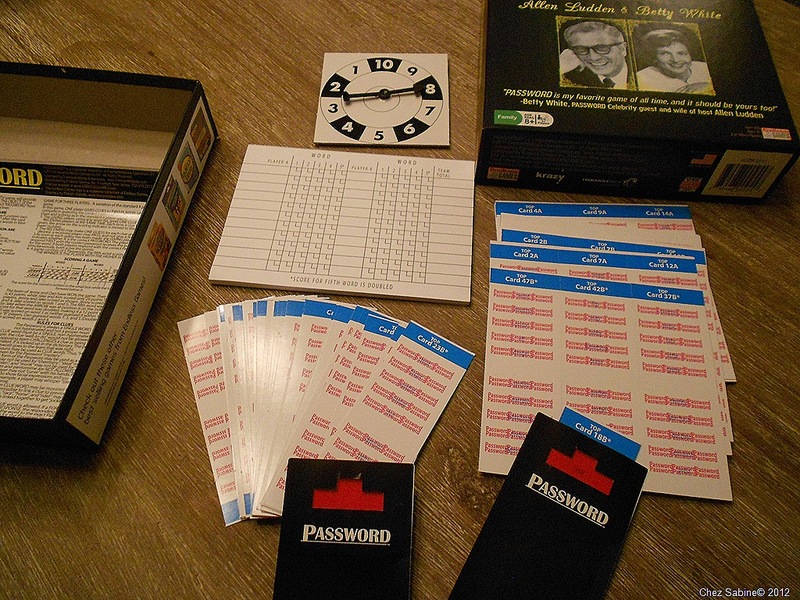 Good news: Password is back and that should please ardent fans of this game. Scoring is simple. The scorecards are easy to read. There are 2000 words that should keep players up for many nights. Bad news: The game is made so cheaply that it’s almost a disappointment. I’d be embarrassed to give this Password as a gift unless it was to another rabid fan. The two card holders are made of flimsy paper. I’m afraid to handle them too much because I think they’ll easily bend and tear. I’m trying to figure a way to laminate the darn things. Last words: For the chintzy quality of the product, the price tag is much too high. But I’m thrilled to have Password back in my life.